Rosemary makes a lovely classic female name. And is commonly used in culinary preparations. This post is about Rosemary (Rosmarinus officinalis) essential oil. 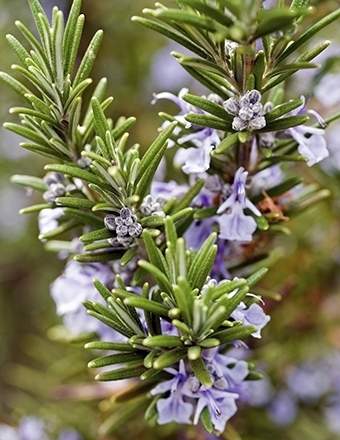 Rosemary belongs to Lamiaceae, the largest of all plant families. Oils such as Lavender, Melissa, Peppermint all belong to this family. In Aromatherapy, some plants have different chemical constituents based on the environment they grow in. The plants adapt in order to survive. And that’s one of “Healing Intelligence of Essential Oils” as Kurt Schnaubelt, Ph.D. points out. “Chemotype” means chemical type. Different chemotypes have different chemical constituents with its own safety concerns. It is essential that you know the chemotype of the essential oil you purchase if there is. Camphor – excellent in massage oil. 1,8 cineol – helpful for respiratory concerns. Verbenone – Great for skin and hair. Rosemary ct.verbenone is steam distilled from the leaves while camphor ct. and 1,8 cineol are steam distilled the leaves and twigs. This chemotype is also suitable for children. Ketones in Rosemary ct. verbenone promotes skin regeneration and stimulates hair growth and prevents hair loss. I have here for you a recipe as hair conditioner and scalp stimulator for dry hair and hair growth. Combine the essential oils in a glass container or PET plastic bottle and then add the carrier oils. Let them synergize for 24 hours before use. PET is non-reactive and safe to use. Place a few drops of the blend in your palm and use your fingertips to massage the blend into your dry scalp. Rub a little onto the ends of your hair too. You can wrap your hair in a shower cap and leave on for 30-45 minutes. Rinse or shampoo lightly. You will have shiny and healthy looking hair! Or apply the blend to slightly damp hair, let dry naturally. Hair will remain soft and shiny. I also created a facial treatment oil for Oily Skin. I have it for sale in my ETSY shop here. 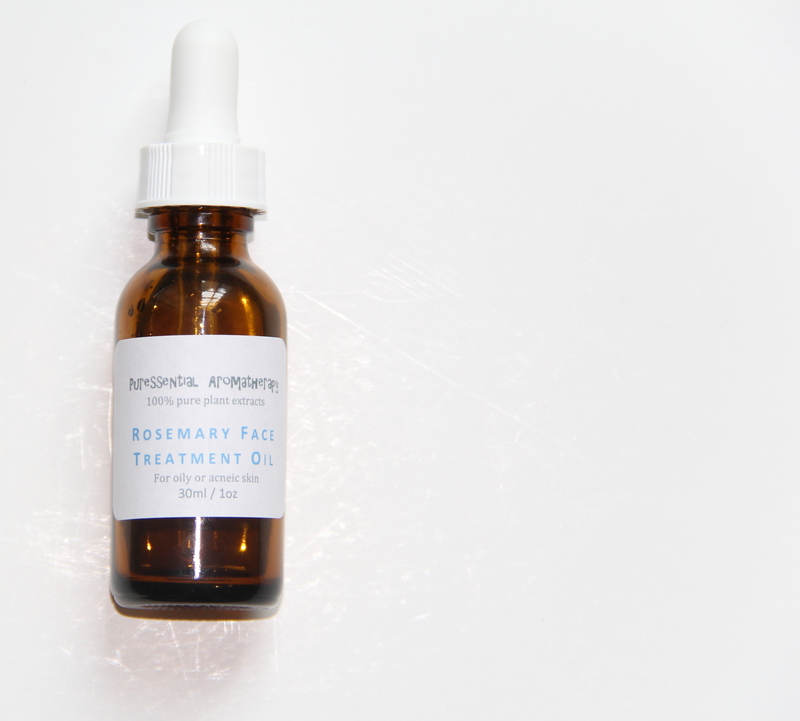 Why in the world does oily skin need treatment oil? “Like cures like”. It works in harmony with oily skin’s sebaceous glands, slows down natural oil production and thus restores balance. I chose unrefined Hazelnut oil as the carrier oil because it is the most astringent of all oils, perfect for oily or acne-prone skin It is absorbed by the skin easily without any feelings of oiliness. To top that off, it contains a number of minerals, and oleic acid and linoleic acid. I added Jojoba oil because its molecular structure resembles our skin’s natural sebum and is anti-inflammatory, Argan oil is rich in vitamin E and various essential fatty acids and has amazing skin healing properties, Organic Sea Buckthorn CO2 contains high amounts of carrotenoids, including pro-vitamin A and vitamin E and C. It offers excellent protection from UV rays. + Rosemary ct.verbenone promotes skin regeneration and is anti-inflammatory. + Cedarwood has astringent and antiseptic qualities, very useful for acne prone skin. Now you know Rosemary is not just a spice, its essential oil has various beneficial properties! I love Rosemary. I didn’t know it had a bloom! Gorgeous. I use it on my temples when I study. It helps me to concentrate. Years ago I had a co worker come up to me and sheepishly admitted she had been stalking me around the office. She just had to know my perfume. Just Rosemary. Now if I could only grow it indoors threw the winter. Your coworker was too funny!